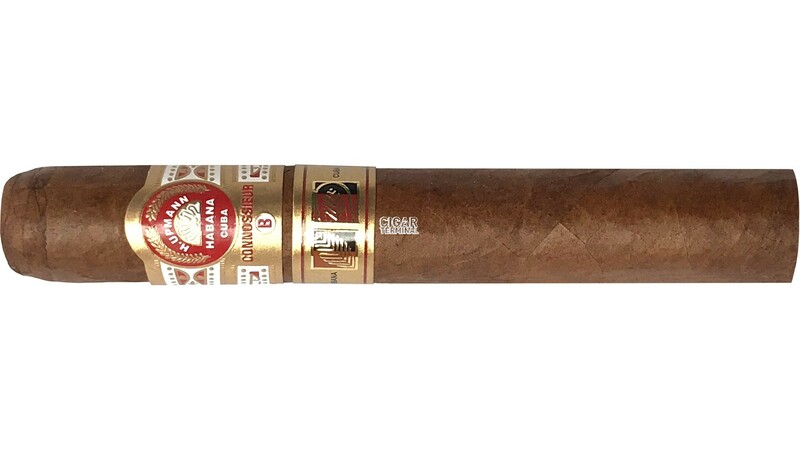 The H.Upmann Connoisseur B is a La Casa Del Habanos exclusive cigar, a massive mild-medium, 54 ring gauge, 5.9” (150mm) long and comes in a box of 25 cigars. Released at the 19th Habanos Festival, it was launched at the same time as the Trinidad La Trova in 2018. Only available in La Casa Del Habanos franchises in limited quantities, it is a very popular cigar. The H.Upmann Connossieur B comes in 25 count slide top boxes with Habanos packing code SLB-VW-GPSR-M-n-25. It is a massive cigar, it feels quite heavy in the hand but its construction appears spotless. Despite not being super oily, it is really smooth and the wrapper is pristine without any apparent veins. It has a nice colorado claro shade, akin to a chocolate with milk. No soft spots, it very well packed throughout. As its brother the Connossieur A, the Connossieur B carries a similar band, the only difference being a B instead of an A, and it is also a La Casa del Habanos release, it also sports the LCDH band. The aromas coming off the wrapper are some faint nuttiness and faint hay. Off the foot, some honey and also nuts. When cutting open the stick, the draw is firm but manageable and gives some herbal notes and some fresh coffee beans. It takes some time to light up this beast but once lit, the Connossieur B doesn’t require any attention. The start of the cigar is powerful on the initial couple of puffs. Lots of nuts and wood flavors. After this rough beginning, probably due to its young age, the Connossieur B mellows down and let you enjoy its smoothness. Plenty of oakiness and walnuts. There is also a good amount of herbal notes, and touches of coffee. Not much sweetness but it is very smooth and creamy overall. No harshness nor any ammonia as you could expect from a young cigar after the initial outburst. The body is now at a mild level. The cigar burns slowly and the white ash holds on for the whole first third. The Connossieur B also emits lots of thick smoke. The cigar remains very smooth and without any harshness in the second third. However, it becomes just a bit stronger, at a medium level now. The flavor profile evolves a bit, the walnut has receded and there is now more oakiness that mixes up with some cocoa flavor. Overall, it is still very smooth and it is still emitting a generous amount of smoke. In the final third, the Connossieur B becomes slightly stronger, but not quite a medium-full cigar. The woodiness evolves into some stronger and more mature flavor, a kind of leatheriness. Few notes of spiciness and harshness towards the end reveal the young age of the cigar. But overall, the cigar is still very creamy. In conclusion, the Connoisseur B is a perfectly constructed cigar, that very smooth and ready to smoke out the box.